There’s something about Spider-Man. Ever since the popular comic book character first hit the big screen in 2002 it’s hard not to be obsessed. And just when you think you’ve almost seen enough of the character we’re given another completely gratifying and unique take that is truly unlike anything we’ve been given before. I’ve enjoyed every Spider-Man reboot and redo that’s been out there: everything from the “Amazing” version, to the fantastic MCU version, the Raimi versions - hey even “Spider-Man 3” is watchable if horrible. There’s something strangely appealing about this web-shooting, wise-cracking hero that feels universal and relatable. Enter “Spider-Man: Into the Spider-Verse” the first animated theatrical film staring the popular wall-crawler. It’s a completely fresh and absolutely hilarious take on the character and everything you thought you new about the friendly neighborhood hero. 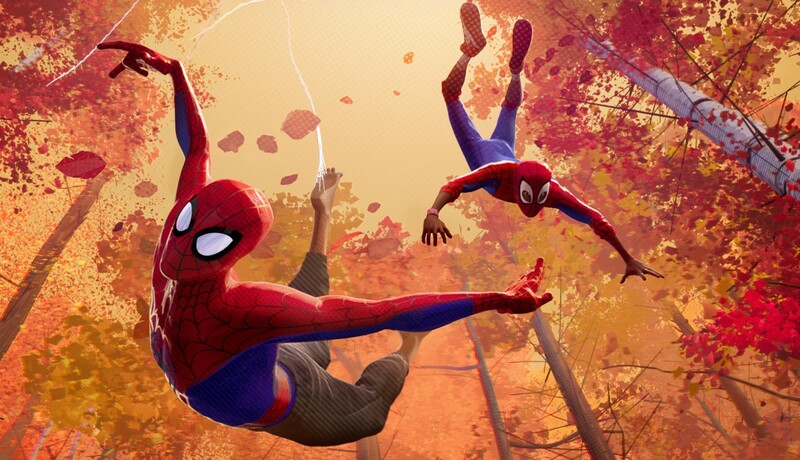 Featuring innovative animation, a truly clever story, and interesting new characters and interesting takes on old characters, “Spider-Man: Into the Spider-Verse” is a must-see for anyone who loves Spider-Man or is a human being. To be honest the look of this Spider-Verse was jarring a bit. The fast-paced action, comic book-like computer animation, and almost stop-motion looking character movements were almost so new I wasn’t sure if my eyes were enjoying it as much as my brain. But as the film progressed and I settled into this new cinematic take on feature animation I really began to dig it. We’re introduced to a teenage Bronx boy named Miles Morales (Shameik Moore) who’s your average city teen except he’s a person of color which feels delightfully refreshing in this genre. His story may seem familiar: one day he’s bitten by a radioactive spider and then he begins to experience bizarre powers that are reminiscent of a spider. But that’s not possible right? Because in Miles’ world there already is a Spider-Man named Peter Parker who spends most of his time heroically saving the lives of the citizens of New York City. In this world Miles quickly learns that there are many Spider-Men in fact. After a portal to another dimension is opened up due to the mischievous work of the evil crime lord Kingpin (Liev Schrieber), a whole handful of different versions of the web-slinging hero are transported to Miles’ reality. There’s a pig version, a black and white version, an anime version, Gwen Stacy as Spider-Gwen, and even an older, disheveled version of Spider-Man. The the unlikely meeting of this spider-powered group band together to defeat the Kingpin and restore the time continuum so that they can all return to their respective universes. It all sounds so convoluted and preposterous but that’s the magic of animation and a top-notch script from screenwriters Phil Lord (“The LEGO Movie”) and Rodney Rothman. A story like this would never fly in live action but in cartoon form, mixed with a perfect dose of clever comedy, in-jokes, and meta humor it all works perfectly well. This movie exists in a world where Spider-Man comics exist and Spider-Man movies exists; the movie knows you’ve seen and read countless iterations of the character and it plays with that. And if you aren’t that familiar with the character (WHAT’S WRONG WITH YOU??) the film probably still works because most of us, myself included, is unfamiliar with the Miles Morales version of Spider-Man anyway.